The reason for the scarcity can be seen on the banks where we stand: sugar cane, which has been planted furiously on former corn land over the last five years. Across Guatemala’s South Coast region, domestic sugar cane, African palm, rubber, and banana plantations are all expanding at the expense of subsistence crop production, and they are sucking the surrounding rivers dry for commercial irrigation. In a country where many rural communities rely on rivers for their daily drinking and cleaning water, industrial tactics of unauthorized diversion, damming, and mechanized water removal threaten the survival of local residents. Since Guatemalan law prohibits the unauthorized removal of river water, people in surrounding communities claim that their rivers have been “kidnapped.” But the people are fighting back to free them. El Rosario is one of 18 predominantly Indigenous communities in the municipality of Champerico that have organized collectively to reopen the five rivers that run through their territory. Usually people do this by force, breaking up small dams with hand tools or removing irrigation pipes. Occasionally, however, the cane companies step in and open rivers themselves to prevent confrontation or to comply with agreements reached with communities. 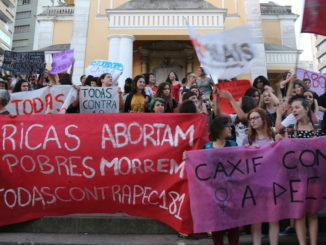 “When we went to liberate the Río Ixpátz, about 30 ?women came with us with pickaxes and sticks,” said Santiago. “But when the authorities from the Palo Gordo sugar company saw us coming, [the company] brought out their heavy machinery and opened up their blockage to let the river run free.” The communities involved now coordinate regular river patrols, making sure that the points they opened stay that way, and keeping track of new water theft. Across the departmental boundary in Suchitepéquez, a group of campesinos organized with the Committee for Campesino Unity (CUC) have occupied a sugar cane and palm plantation for over a year, as one pressure point among many in the broader struggle for agrarian reform in Guatemala. 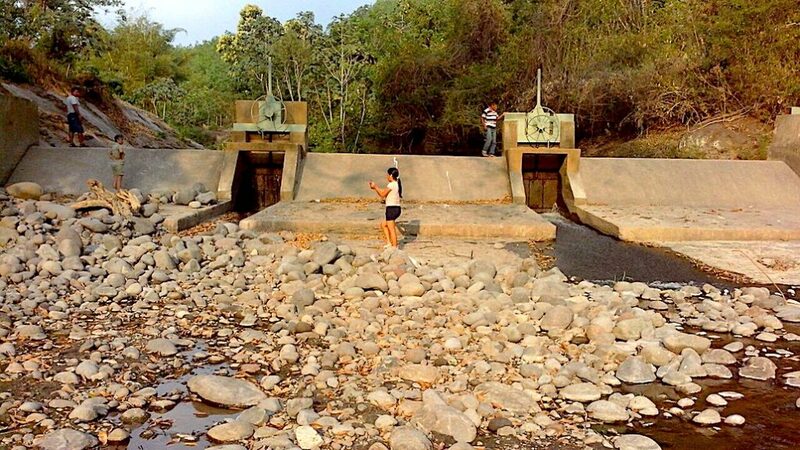 One of their first actions after arriving was to remove the irrigation motors that had been draining the Río Icán. After ensuring a source of water for their new community, the group went further upstream and used pickaxes and chainsaws to remove a diversion channel placed by the Tululá sugar cane company on the nearby Río Sis. The movement to free rivers in the South Coast is regional, with individual actions involving people from communities that aren’t necessarily affected by the particular river in question. 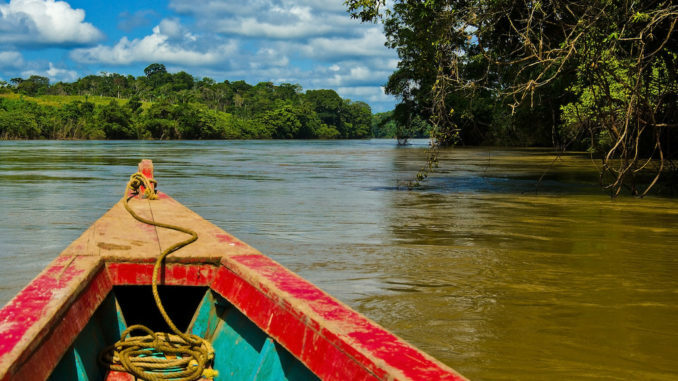 Communities surrounding El Rosario are organized into a local network and participate in the liberation of nearby rivers whether or not they flow through their community. In other parts of the South Coast, people respond to calls to join river liberation put out by campesino organizations. At the Suchitepéquez occupation I spoke with Fernando, a man who was shot by private security guards while opening a blockage of the Río Sis, far from his own home. I asked Fernando if he felt disillusioned with the struggle to free rivers after being shot. “On the contrary,” he said. “I think I became braver … today I feel very calm, more motivated to continue struggling so that one day we can achieve the liberation of our rivers.” With the wound to his torso healed, Fernando told me that he is ready to help out other community liberation actions in the coming dry months. The tactic of freeing rivers began in February 2016 and took Guatemala by surprise. The illegal removal of river water by agribusiness had already been a major problem for years, but before a few hundred locals freed the Río Madre Vieja in Escuintla, no other bodies of water had been re-opened by community members. Since then, communities across the South Coast have liberated their rivers one by one, breaking open dams, closing diversion channels, and ripping out irrigation pipes. A river dam on the Rio Nil near El Asintal, Guatemala. These communities have the law on their side – kind of. Article 260 of the Guatemalan Criminal Code prohibits the damming, diversion, or blocking of water sources in a way that impedes the right of others to that water, punishable by one to three years in prison and a fine of up to Q5,000 ($680). But the article also establishes the same punishment for the partial or complete destruction of dams, canals, and other infrastructure, opening the communities up to possible jail time for their actions. In 2016 alone, 1,237 complaints of water theft and river pollution were filed with the Guatemalan Ministry of the Environment and Natural Resources (MARN). Of these, however, MARN only referred 41 to the Public Prosecutor for investigation. All companies named publicly in the 41 investigations are Guatemalan-owned. Instead of initiating criminal proceedings, government officials often convene roundtables with affected communities and agribusiness representatives in order to come to water-sharing agreements. Everywhere I visited, however, community members told me that the agreements led to nothing, that companies either do not honor their commitments or that they rebuild water blockages after removing them. Within this frustrating context, grassroots pressure has been building for the state to regulate water usage in Guatemala. 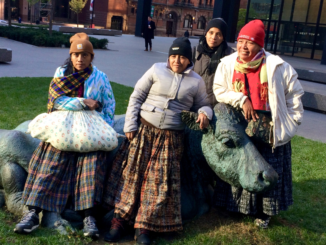 In April 2016, 35,000 campesinos walked for an 11-day Water March, drawing attention to the plight of communities facing not only water theft but also rampant industrial pollution and the construction of contested hydroelectric dams. 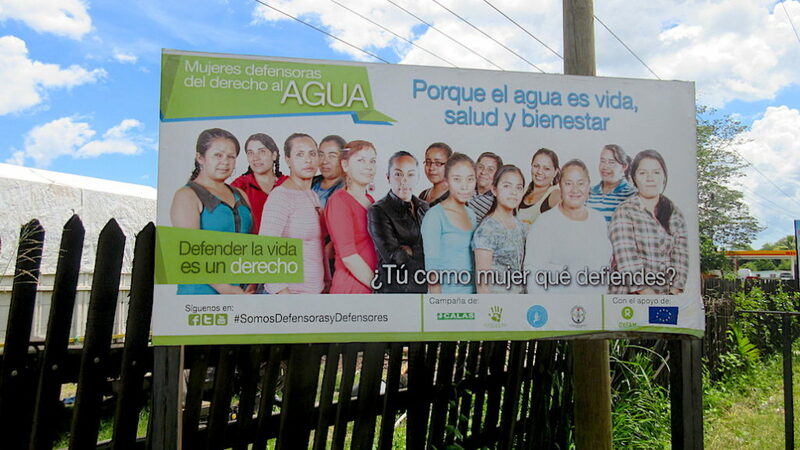 Just weeks after the march, Leocadio Juracán and Sandra Morán, social movement leaders-turned-congressional representatives, proposed a law that would protect communal water access and condemn its industrial theft. Just north of the coastal lowlands, I visited the municipality of El Asintal, Retalhuleu, which suffers from all three offences addressed by the Water March: illegal usage by industry, pollution, and a hydroelectric dam. El Asintal is nestled between two rivers, the Río Xab and Río Nil, and is comprised of 28 communities. The majority of these are built along the banks of one of the two rivers, and until recently they enjoyed access to unlimited clean water. Not anymore. Community investigations have revealed contamination from industrial chemicals, fish farming, and the raw waste of chicken and pig farms, all dumped directly into the rivers. Responding to a wave of skin diseases and diarrhea, residents patrolled the length of their rivers to investigate contamination. In addition to industrial pollution, they were surprised to find a hydroelectric dam under construction – the 1.6 MW Santa Margarita project. Down river, the community found that the trickle of polluted water left in the Río Nil is being further diverted to South Coast plantations. If the level of contamination suffered by El Asintal’s residents seems alarming, it is far from uncommon. 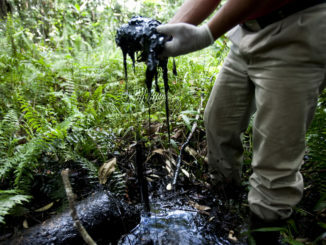 Guatemala’s Minister of the Environment, Sydney Samuels, recently stated that 95 percent of Guatemala’s rivers are polluted. The 28 communities of El Asintal have banded together in the El Asintal Environmental Defense Committee and are currently fighting to have their rivers cleaned up and to prevent dam construction. This is a common story across Guatemala, where 103 hydroelectric dams are currently licensed or under construction, to be added to the 35 that are already operational. The Ministry of Energy and Mines recognizes that 14 of the dam projects are the subject of conflict with surrounding communities, but the number is undoubtedly much higher. The dam at El Asintal, for example, is not listed as disputed. Alongside hydroelectric dams, metals mines also exploit and pollute water sources. The Marlin Mine in San Marcos reportedly uses 45,000 litres of water per hour, and high levels of arsenic, cyanide, and mercury have been detected in nearby water sources. Each of the four operational mines in Guatemala is also the site of severe conflict, with militarization and repressive violence swirling around mining-affected communities. The expansion of agribusiness on the South Coast is just one piece of a much larger scenario in Guatemala: the extraction of natural resources is draining and polluting water, stealing land, and violating Indigenous rights. And where extractive projects spread, they bring with them increasing levels of violence and conflict. Since 2002, at least 43 land and environment defenders have been murdered in Guatemala, according to the international NGO Global Witness. The Guatemalan rights monitor UDEFEGUA lists thousands more who have been wounded, threatened, arrested, or displaced. While communities resisting mining and hydroelectric projects have suffered militarization and targeted armed attacks, those affected by water theft on the South Coast are confronted on a regular basis by the private security guards and armed company employees that patrol plantations. When they aren’t confronted by security guards, many water defenders are hounded by legal claims placed against them by plantation owners and agribusiness companies. One community in the municipality of San Andrés Villa Seca, for example, dug up and removed an unauthorized drainage pipe that ran contaminants under their fields, and residents have been accused of crimes in retaliation. Alfonso showed me the legal summons issued to him: he is accused of “coercion and threats” – in other words, organizing his fellow community members to defend their rights. Criminalization – defined as legal complaint, illegal or arbitrary detention, or defamation – has become a tactic of choice by corporations against grassroots organizers. Amnesty International recently decried the systematic use of the Guatemalan and Honduran justice systems to target activists, noting that “criminalization … is aimed at breaking up movements and organizations, wearing down the defenders and removing them from the public arena.” The law, it seems, works as yet another tool in the bag of those who will stop at nothing to put down community opposition to extractive projects. After liberating rivers from industrial water theft, community water struggles are still far from finished. In many cases, plantations return to replace the removed infrastructure or simply shift to other points on the river to construct new channels, dams, or wells. Even when liberated rivers stay open, however, the problem of water pollution remains. Julio pointed out that even though his community has maintained the water depth by liberating the Río Icán, “all the pollution is still there since it comes from the rubber farms up there. There is a rubber plantation upstream and they throw all their waste into the Río Icán, so the water comes this way and you can’t drink it. The animals do, but we can’t drink that water.” Kidnapped and freed, water on the South Coast is still being poisoned to death. Instead, the communities plan to take up additional direct action tactics to force the companies out. Among these is a planned highway blockade during the sugar harvest, so that company trucks cannot transport cane to refineries north of the plantations. An escalation of conflict on the South Coast seems troublingly likely. Water needed to survive is drying up and what is left is undrinkable. Land to grow food for subsistence is disappearing too. And the response of the authorities and agribusiness has been to give communities the run-around or bog them down in legal claims, in an attempt to undermine resistance. But resistance is growing nonetheless, and the levels of repressive violence seen around mines and hydroelectric dams across the rest of Guatemala may not be far away. As rights, resources, and territory are trampled for profit on the coast and across the country, Guatemala finds itself in a worrying decline into further violence. The names in this article have been changed to protect identities. Copyright, Upside Down World. May not be reprinted without permission. ?